I was involved in theater from a young age. I studied acting and directing in college and spent much of my twenties engaged in Seattle’s active theater scene. Several years ago, I had the privilege of being a guest speaker for a class of undergraduate business students at the University of Washington. During the Q&A, when I was asked what my major was, the class was surprised to hear that I had a degree in Theater. “How did a drama major get into the consulting business?” the class wanted to know. I told them matter-of-factly that I use the skills I learned as an actor and director every day as a consultant. In truth, all performance-related arts are project-related by nature. They require careful planning, thoughtful recruitment of talented people into different roles, and vigilant management of both time and budget if the final production is to be successful and the producing theater company to be sustainable. While I wasn’t aware of it at the time, every time I participated in a theater project, I was learning project management skills that directly translate to the planning and execution of projects in the business world. In this blog series, I will describe a few of the key principles that I shared with that class of business students and encourage project managers to consider on every project they manage. A good director has a concept for what the final production will be and, perhaps more importantly, the impact they want to make with that production. Some of these are given: is the play a comedy, a drama, a musical, or something avant-garde? Each genre has its own conventions which shape the show. Beyond that, though, the director’s palette is wide open. What is the mood of the show? In what period will it be set? What will the sets, lighting, and costumes look like? These decisions are typically made within the context of the overall concept for the show as well as the desired impact of the show. The same is true of many projects in a business setting. By having a clear concept of the end product, the project manager avails themselves to the power that comes from telling a story. By painting a picture of the outcome, their team members can work to make that outcome a reality for their customers. Having a clearly defined concept and communicating that concept clearly and frequently helps to enroll everyone into the project vision and helps people understand that they are engaged in building something bigger than themselves. This taps into people’s passion and creativity and creates an environment where they are engaged in their work. By having a clear concept of the end product, the project manager avails themselves to the power that comes from telling a story. Perhaps just as important as what the end product will be, however, is having a concept of how the creation of that of product will come together as a whole. When a director undertakes a new show, he or she considers the team environment they want to create to bring that show together. For newer works, when the script and end product is still in flux, the director may adopt a highly collaborative approach to rehearsals and production design meetings. If the timeline is tight, the director may adopt a very deliberate command and control approach. The director’s concept of the approach and environment he or she creates has a direct impact on the kind and quality of work being performed all the way up to opening night and throughout the run of the show. The mindful director is aware that the approach and tone they set for running rehearsals, running production meetings, and putting all the pieces together for the show directly effects the quality and the character of the end product. Mindful project managers understand this. The approach and tone they set for the execution of a project can have a tremendous impact to the final outcome. Project management is not a “one size fits all” proposition. A command and control approach, for example, is not always best, even if it helps the team meet deadlines. A project manager who leaves “dead bodies along the road” on every project will end up very lonely. By taking time to create a concept as to how it can all best work together, the project manager seizes the opportunity to be intentional in his or her approach. And, as we know, much has been written about the power of intention. 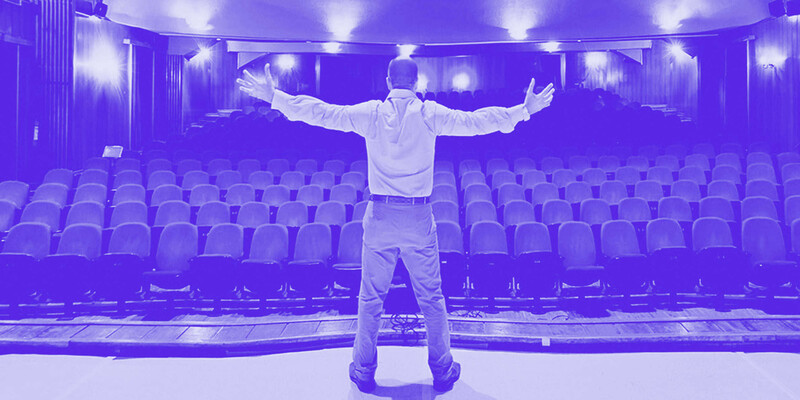 My experience in theater helped me understand that managing a project is, in its own way, a creative act. To be clear, not every project is a “Hamlet” and not every project will change the world. Regardless, if it’s a project worth having a project manager, then it’s a project worth having a clear vision of what it needs to achieve and of how it wants to achieve it. It matters who is cast as Batman. Discover the hidden secret to any great show (or project).